Bradgate House, Groby Leicestershire in 1520. The house is a group of ruins today and is occupied by peacocks. ​I live a few fields away by foot to Bradgate House in Leicestershire which was completed in around 1520 but now stands in ruins in the medieval deer park. It was the birthplace of Lady Jane Grey, great-grandaughter of King Henry VII, who was crowned Queen of England in 1553 and reigned for only 9 days. Some research into the local history revealed a painting of the house as it would have been, in all its spender and opulence. 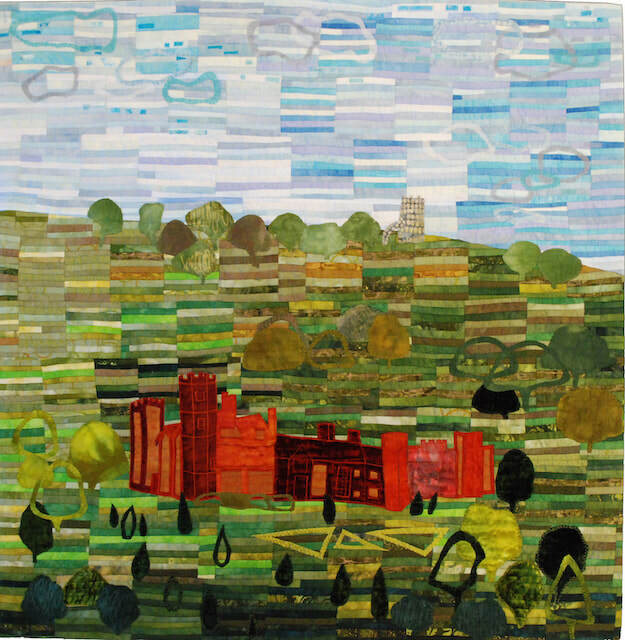 This quilt captures the importance of this house in British Tudor history.